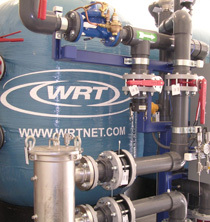 WRT provides the most effective processes available for removing radium, uranium and other contaminants from water. Our complete package of services includes process equipment, proprietary treatment media, safe exchange of media, and proper handling and disposal of used media. WRT offers the simplest, safest, most effective and economical processes available for treating water that contains contaminants such as radium, uranium, arsenic, chromium, barium, and ammonia. WRT provides a total solution, from process equipment and safety assurance to the handling, removal, transportation, and disposal of treatment residuals.